Be the first to share your favorite memory, photo or story of Lula. This memorial page is dedicated for family, friends and future generations to celebrate the life of their loved one. 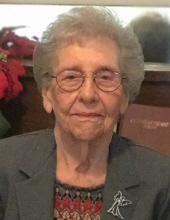 Crouse - Mrs. Lula Bessie Hoyle Neal, 94, passed away peacefully on Tuesday, April 2, 2019 at her residence. Mrs. Neal was born on April 12, 1924 in Lincoln County, NC a daughter of the late Luther Hoyle, Sr. and Lula Williams Hoyle. She was retired from Rhyne Mills in Lincolnton. Mrs. Neal was a member of Leonard's Fork Baptist Church in Lincolnton where she served as a former pianist and Sunday school teacher. She also enjoyed fishing, quilting and gardening. In addition to her parents she was preceded in death by her husband Warren G. Neal; three sisters and three brothers. Survivors include two sons, Garlin Neal and wife Elaine of Crouse; Wade Neal of Crouse; a daughter, Gail Sneed of Lincolnton; a sister, Mildred Chapman; a brother, Herman Hoyle of Kings Mountain; seven grandchildren; 16 great grandchildren and 22 great-great grandchildren. Visitation will be from 10:45 to 11:45 AM on Thursday, April 4, 2019 at Leonard's Fork Baptist Church and at other times the family will be at the home. Funeral Services will be held at 12:00 PM at Leonard's Fork Baptist Church with the Rev. Jaie Warlick officiating. Memorials may be made to Leonard's Fork Baptist Church, Building Fund, 1462 Leonard's Fork Church Rd, Lincolnton, NC 28092. Stamey-Cherryville Funeral Home & Cremation Service is serving the family of Mrs. Neal. To plant a tree in memory of Lula Bessie Hoyle Neal, please visit our Tribute Store. "Email Address" would like to share the life celebration of Lula Bessie Hoyle Neal. Click on the "link" to go to share a favorite memory or leave a condolence message for the family.